TopHat is an instrument that has been designed to collect data on the CMBR. Its mission is to study light in the microwave and infrared wavelengths. The TopHat experiment includes a spinning telescope and a detector system. It will map a 48 degree diameter disk of the sky above the Southern Polar Cap. To accomplish this, the telescope will simply spin at a constant rate about its vertical axis. As the Earth rotates, the entire polar cap will be observed each day. 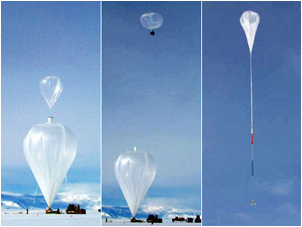 PhD Thesis Defense, Thomas Crawford, "Mapping the Southern Polar Cap with a Balloon-borne Millimeter-wave Telescope"